Well, that 3 weeks went by in a blur. On the one hand, it feels like it's gone by pretty quickly. 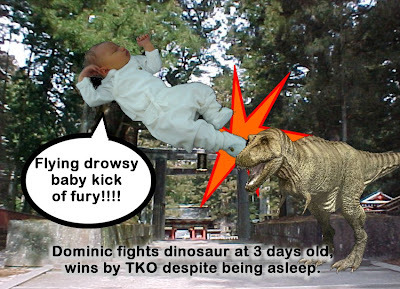 On the other hand, it felt like we were in hospital for a really long time, and pre-Dom feels like a lifetime ago. Dominic seems to like being sung rock power balladz as opposed to nursery rhymes and lullabyes. Every Rose Has Its Thorn and a bunch of Skid Row songs are the most popular so far (though Alice Cooper's Poison was appreciated also). Oddly he also seems to like the Christmas carol 'Good King Wenceslas'. - they mowed our lawn and did some gardening! Next week it's the return of the parents, plus brother! We are really looking forward to it. Not much sleep lately. Went for nice 40min walk with Dominic today in the morning. It is sunny. Debbie and I watched the DVDs of HP 4 and 5 last week - 5 broken between pre and post Dominic watching, I think. I enjoyed both of them, and would say that as a series of movies they are getting better. Debbie's midwife asked whether we'd read any of the books, and I confessed that I had not. More than that, I had made a conscious decision not to. I couldn't really explain why at the time. She suggested it might have been because they were 'too cool', which is a possibility. Certainly the wave of merchandise that accompanied the first film did place the series in the 'very commercial and popular' category. But then, I enjoyed the Pirates of the Carribean movies, so commercialism alone wouldn't put me off. I think, on reflection, it was the length and unfinished (at the time) nature of the series that put me off. I like books that are between 150 and 300 pages. I think my 'sweet spot' for books is around the 200 page mark. Kurt Vonnegut, John Brunner, William Burroughs, some of my favourite authors write shorter novels. Of course I also enjoy longer books - though I read few series of books these days. I used to read Dragonlance novels, and have read Lord of the Rings a few times, but I tend to avoid long series of books. I think the opportunity cost is a factor - if I'm going to read 7 books, I could read quite a variety of interesting authors and different set-ups, or I could read Harry Potter for 7 books. The HP may be excellent, but it currently struggles to win over the other books on the 'to read' pile. It's amazing the things you don't really care about when you're a parent. Parents thrilled. He's back up to 3,725 grams. His birth weight was 3,900 I think, so he's still smaller than when he was born, but that's quite normal (up to 10% wieght loss in the first week is within the normal band, I think our midwife said). He is still very cute. Being home is great. We got home late on Wednesday(about 8pm?). We aren't sleeping a lot as the little man is a voracious feeder, but it is nice to be in our own peaceful home with our family. We managed a family trip to the supermarket yesterday, which was cool. Anyways, typing whilst holding Dom is hard, so I will sign off there. Labour wasn't so much fun (though it went well and only took 6 hours), but having a kid is fantastic. Dominic was born at 6.10am on Sunday, 9th December. He's a very cute wee chap, and is doing pretty well. We're hoping to be discharged from hospital tomorrow - they want to check out his breathing (a little fast) and the common heart *valve? * thingee that lots of babies have (the one where it closes either just before or just after birth). He's had some x-rays, and seems pretty healthy, but they're being thorough, which is good. I'm also glad I got a new cellphone. I got one with a camera (the cheapest one with a camera in the store), and it's snazzy and wee. And it lets Debbie ring me at school with important questions about midwife appointments, and txt me and so on. It's really quite neat to have caught up with 2000's latest technology :-) (they had camera-phones in Japan when we went over there in 2001, and they weren't super-brand-new. In fact, by the time we left in 2002 they were giving camera-phones away free if you signed up to a 12 month plan. Debbie and I had a busy weekend which included seeing the CG Beowulf movie on the big screen. Sadly we were about twenty minutes late for the 3D version - which is to say we arrived just as the slides would have been starting, but the queue was at least twenty minutes long. We decided to see it in 2D rather than wait around for a later session. I enjoyed watching it, although I was a littler nervous after the first couple of minutes, as the ratio of gimmicky shots that would look good in 3D to normal visual story-telling was not one which favoured the regular type cinema. It did calm down after that, and while there were a lot of shots which went on longer than they might otherwise have done to allow for cool 3D bits, and some obvious 3D-friendly shots, it was quite a watchable film in 2D. There was fighting, bragging, sleaze-which-failed-to-titilate, a cool dragon, and Angelina Jolie as an unconvincing CG barbie doll. There were odd changes to the storyline and characters, some with no pay-off. There were spiky things pointing straight out at the audience, presumably looking cool in 3D. Without going into detail, I'd say it was an enjoyable film, and if you don't know too much about the story of Beowulf you'll probably be happy to sit throught it, though there are a few moments where you might justifiably mutter *wtf!?! *, as characters make inexplicable decisions or villains act randomly. One of the oddest things was that the biggest changes looked like they had been made to give the story a theme or moral that modern audiences could connect with, but then the film failed to deliver any coherent pay-off to those changes. I wonder if bits were cut out? I just finished bowling with my form class (about half of them). High pressure situation, could have gone disastrously wrong! I'd told them that I like bowling, and that I usually bowl over 100 (though not always).